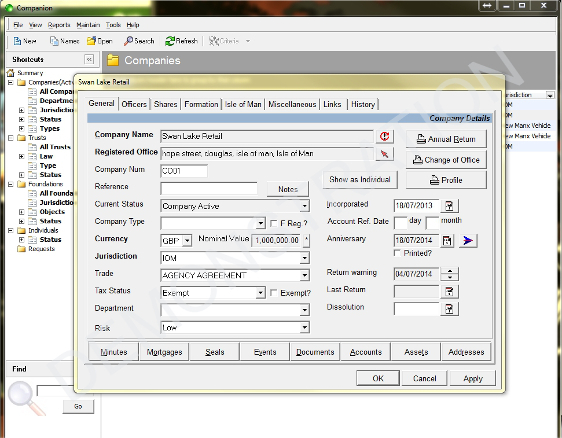 Companion is a full-featured multi-jurisdiction company and trust administration software package. Equally suited to both a small office or a large corporate environment, Companion has the power to help you manage literally thousands of companies. Companion generates extremely accurate representations of these forms, and the system is constantly being updated with new form designs and support for new jurisdictions. Companion goes out of its way to make tasks simple. 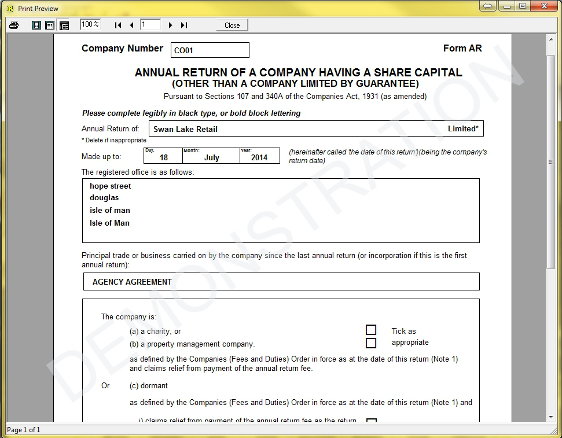 Minutes, events, forms, registers, etc. ; all are quick and easy to find. Every step of the way Companion is there to help you and it even reminds you of any tasks that are due each time you log in. Its scalability ensures that a practically unlimited number of companies can be supported, along with their officers and shareholders, and the sharing of common data results in outstanding performance. 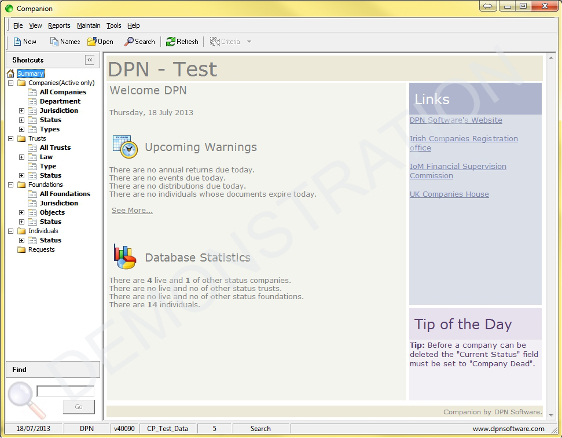 Companion uses an ODBC relational database. This means that most commercial database engines can be employed and enables reporting through established ODBC tools such as Crystal Reports. Tribute is a time and service recording system with invoice production and tracking. Tribute is very much in the style of Windows. Icons, menus, properties, etc. are all accessible using either the mouse or the keyboard. Everything is easy and quick to get to and all screens behave in the exactly the same way. 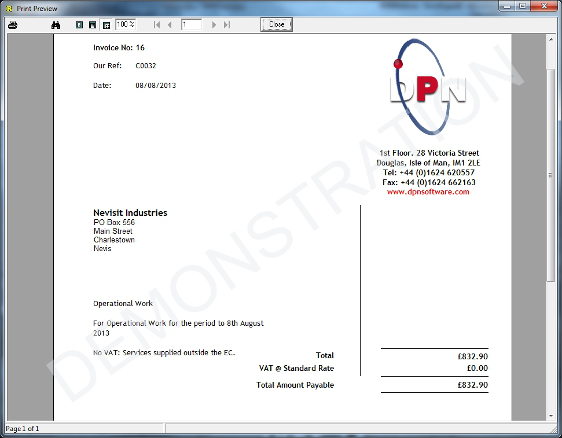 Track time for projects being undertaken and produce an invoice for your customers. 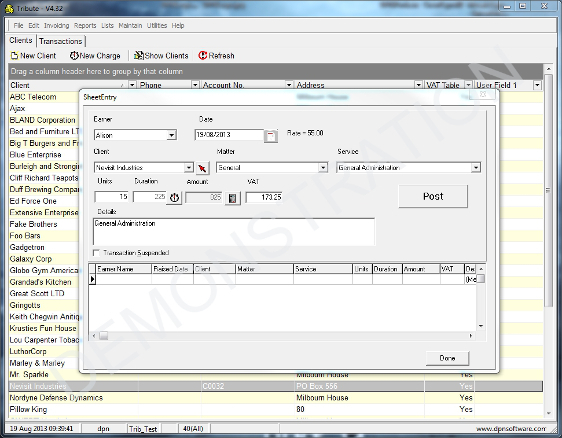 Your monthly invoicing done in seconds and you can produce fully customised and professional looking invoices. 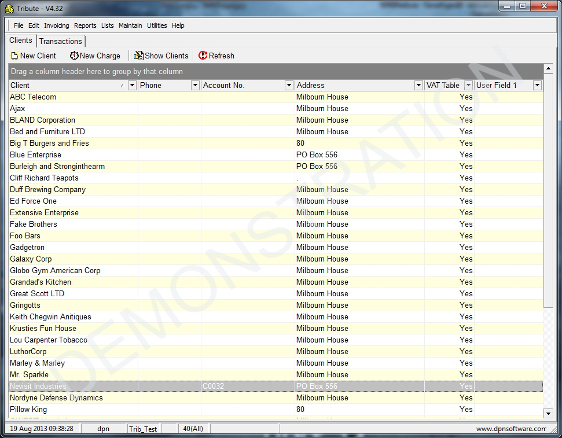 Full history and charge analysis reports that can be fully tailored to your needs. Can be customised for your business including types of fees, units of time and services unique to you.